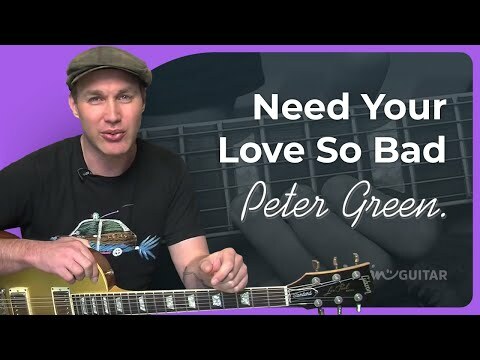 I'm learning "Need Your Love So Bad" by Peter Green. I love how relaxing it is to play. I recorded my progress today; my own take on the intro solo. It's also my first attempt at recording in Garageband on an iPhone using my new Christmas toy; a Presonus iOne. I'd love some feedback on my playing, if you'd be so kind. Far better than I can manage still. A couple of notes seem a bit late, kind of Willie Nelson style - it works for me. @rlw thanks! I think I started the intro maybe a quarter or an eighth of a bar too late. Dave Simpson on youtube has some really good tips for getting close to Peter Green's sound, the vibrato is absolutely crucial. I always find it a bit of an awkward solo to play as the feel needs to be sparse and delicate but the phrases should still be played with intention. You didn't overplay it which is a good start. And I liked the tone. Thanks very much for the pointers @Neill and @flying_pie , I'll take a look at the suggested watching. This is what i used to try and learn it. Theres lots of subtle techniques like using staccato on a few notes, it really makes all the difference. Its a great solo, simple, just a few notes but all used to great effect. When you're ready to play the whole song this song sheet will save you a lot of time working out the ending. I've never seen a covers band play this ending they usually fudge it. The orchestral version that was released was only one of a number of versions. The band played it with guitars and keys as well, I've listened to about 6 versions on the rereleased box set. Oh and don't let anyone tell you there's an augmented chord at the end of the chorus. I think some of the YT videos add one Michael Carswell perhaps?. It absolutely is not there and it annoys the f*** out of me when someone adds it. The only thing I would add to the wise words above is to almost now forget playing the notes as written down - and now play (the same notes but) the whole passage as YOUR piece. That is, to get the flow of the melody as a whole melody rather than a just a collection of notes.